Or just stinkin’ love handmade projects?? Here’s a fun and very inexpensive way to do so. Toss in a little hand-made lovey……just from you. I found this tutorial from Martha, HERE. And then decided to dress her up…..
For the dress, cut out two rectangles that are 6 x 9 inches each. Hem the top and bottom by folding under a 1/4 inch, then a 1/4 inch again and sew into place. Then, with right sides together, attach the two rectangles together at the sides. Leave about a 1 inch opening about 3/4 of an inch down from the top, as an opening for the bunny’s arms. 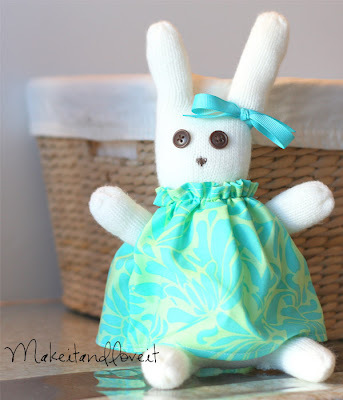 Then put the dress on the bunny and pull the arms through. Then pull the outside thread on one of the ends and slide the fabric together, making a nice gather. Make the gather snug around the bunny’s neck, then tie your ends (your 2 outside thread ends) in a quadruple knot. Gosh, that is harder to explain than I thought. If you have never gathered before, I hope that helped a little bit. And if you already know how…….good job enduring the torture. Now, tie a bow in that bunny’s ear and plop in a basket. I want to make bunnies and doggies!! I wish I had seen this before all the gloves were gone for the season. Maybe next year or maybe I’ll get lucky and find somewhere that has gloves on clearance. thanks for the idea. mine didnt turn out as good as yours, but i think if i keep trying your fun projects they can start to be as good as yours. thanks again i love this website. 1st and 2nd in Rexburg. Leave a comment on our blog if you are interested in having a booth. I made a couple of these and they turned out so cute! Not as cute as yours though. Thanks for sharing! This is adorable. I just may have to make one for the big O. 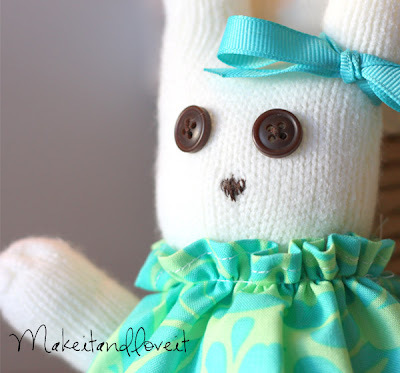 If a bunny is going to a baby who might be testing out new teeth, then embroidered eyes are better than buttons.